At 26, Welles directed —and starred in—Citizen Kane (1941), based loosely on the life and career of media magnate William Randolph Hearst and considered by most critics of film the greatest American movie ever made. In addition to telling a compelling story, the film introduced innovations in narrative, cinematography, lighting, and editing—all of which exerted a profound influence on film. 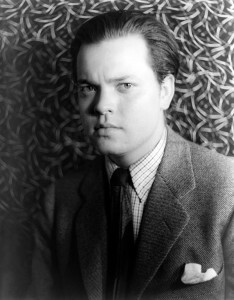 Although Citizen Kane was the apogee of Welles’ career, he had also earned fame—and notoriety—for his radio plays, especially his 1938 adaptation of H. G. Wells’ War of the Worlds, which used the format of a news broadcast, projecting such realism that it caused widespread panic among listeners who believed the earth was being invaded by Martians.